Heavy bleeding can be one of the symptoms of uterine fibroids and is usually based upon the location in the uterus of the fibroid tumor(s) you are dealing with. Heavy bleeding can also be a symptom of various other issues besides fibroids. If heavy menstrual bleeding is a problem for you, there are many herbs that can help to normalize your flow. One important herb for heavy bleeding is shepherd’s purse and here is more information on using shepherd’s purse for heavy bleeding. Before we go into using shepherd’s purse for heavy bleeding we shall look into this herb and why it is beneficial for natural healing including other health conditions it can help with besides heavy menstrual bleeding. 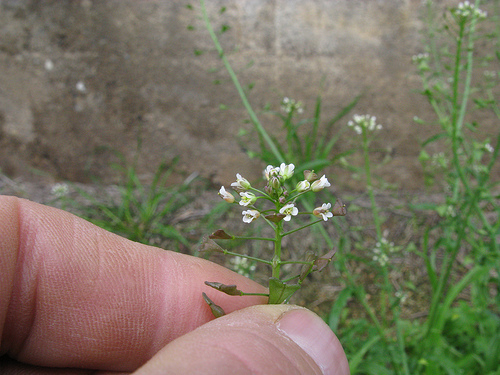 Shepherd’s purse (capsella bursa-pastoris) is from the family known as cruciferae and other members of the family include broccoli, cabbage and cauliflower. This herb has been used for thousands of years as a natural remedy for various conditions although it is not one of the stars of herbal healing which is why a lot of people are unaware of its benefits and it is usually forgotten about. Inducing labor in women ready to deliver due to certain compounds that this herb contains which can help to stimulate uterine contractions. But if you are pregnant or trying to conceive, you should not use this herb because of its action on the uterus. It can be used to treat hemorrhoids and wounds due to the mild inflammatory astringent actions that this herb contains. This herb is usually recommended for treating heavy bleeding because it contains various properties that may help with blood clotting based on some research studies. But if your heavy bleeding is very severe and prolonged, you may want to seek medical attention because this could be a very dangerous situation besides you becoming anemic. While this herb may not be a substitute for medical treatment for heavy bleeding, you might want to give it a try after talking with your doctor although this herb has been approved in some European countries as an effective natural treatment for heavy menstrual bleeding as well as persistent nosebleeds. When using shepherd’s purse for heavy bleeding, make an infusion that contains 1 teaspoon of the dried herb added to one cup of boiling water and steeping this for 10 to 15 minutes before straining and drinking. You may drink up to two cups a day. The taste of shepherd’s purse can be unpleasant and biting so you may want to consider adding a bit of honey, stevia, lemon, etc to help improve the taste. If using a tincture of this herb (extract of the herb using alcohol), take between ¼ and ½ teaspoon twice a day. For commercial products of this herb, simply follow the manufacturer’s guidelines on usage. If you re taking blood thinning medication which can include aspirin, do not use this herb. As mentioned previously, pregnant women should avoid this herb. If you are nursing, you should also avoid this herb. Do not use this herb is you are dealing with heart disease or have a history of heart disease because the blood clotting activities of this herb may trigger stroke/heart attack. Do not give to children under 2 and use a low dose for those over 65. Like anything, some people may be allergic to this herb. If you discover that you are, reduce the dose or stop taking this herb. This is just a bit of information on using shepherd’s purse for heavy bleeding. If shepherd’s purse is not in the vicinity (you can buy organic shepherd’s purse here), an easy alternative is using cinnamon for heavy bleeding. For an effective homeopathic remedy that includes shepherd’s purse among many other beneficial herbs, you may want to consider if you are dealing with heavy menstrual bleeding trying the MensReduce natural remedy. Find out about this effective natural way to normalize your menstrual flow by clicking here.